I never expected to be a minority. I grew up white as can be in white suburbia, in a nice town, in a great school system getting average grades. I loved blocks, and ponies, and riding my bike. Nothing about my childhood seemed anything other than typical. It wasn't until college that my being female made me feel any different. I majored in Accounting and minored in Comp Sci at a liberal arts college with a 75% female student body. My business classes were 75% male and I was the only female in a class of 30 in my minor. Growing up, I never heard anyone say “you can’t do that because you're a girl”, so I never felt that way, but it was still a bit odd to be surrounded by men while exploring MY interests. My Lego collection (mostly Pirates, Castle and City) had a similar affliction. Though I did delight at the nuance of the rare female pirate, I never let a silly thing such as whether or not my toys were intended for girls or boys determine what I really liked. I viewed my education and intended career with the same carefree attitude, although I still remember my one female accounting professor enlightening me to the fact that only 10% of CPAs are women. Years passed. I finished school. I got a job. I got married. I started a family. I quit working 3 days before the birth of my 4th and final female child (my poor husband is plagued with daughters). At that point, I started to notice all the ways in which I am a minority. As an SAHM, I am part of only 24% of US mothers. The majority work at least part-time. I have more kids than the national average, and as a result, a minuscule net worth. The most important way that I am a minority, is because of my intelligence. According to SAT and GRE scores, I am ranked in the highest 5% of the population (among those who have taken these tests). Needless to say, after the first year at home, I got bored. Hence, I came out of my dark ages, just as my oldest decided she NEEDED the full line of Harry Potter Lego. I never much cared that Lego was "for boys". I just really liked the product. My girls and I are Lego maniacs, and I wouldn't have it any other way. Close to a year ago, I registered on BrickPicker. I read the forums, but didn't start posting until a few months ago. I had no idea I had so much to say. It was refreshing to chat with “adults”. As an AFOL, I really liked finding a place to share my thoughts instead of monopolizing the time of my local Lego Store employees. As an AFFOL (the first F stands for female), I started to notice just how very male the Lego reseller market is. As with most things, it doesn't really matter to me, but I do find it a point to ponder. I look forward to sharing with you as I explore the impact of gender on Lego sales and marketing. Thanks for the share Poly. It was great to read the brief, but interesting story of a fellow Brickpicker! I have an older daughter and a younger son. I have pushed LEGOs very hard with them both. What is better than a 3d puzzle that you can play with?!!!! I can happily say that both my kids love LEGOs. They both play with them very differently and my wife carries the Master Builder badge way better than I do. She is excellent at building, and the kids always ask her for help first .... then me if she is busy :). My wife is also a SAHM, and that was not planned or done because she was the AFFOL, the math pointed us that way (another story for another day). I look forward to seeing you online. All the best to you and your family. Great read, and always happy to have more posters. I love reading threads, but I really, really like seeing a new blog post. I only have one daughter and am starting to see how societal concepts of gender affect her (and me). I've never pushed anything on her, but she is drawn to Friends and Disney Princess Lego like a cat to cat nip. I wish she'd ask for Harry Potter (perhaps she will as she'll be old enough to see the new planned HP universe movies as they come out - she might be cranky that I sold all of my HP lego). As for gender/marketing and Lego, I am particularly interested in your perspectives. I've got a couple articles in the works that include sets from the 'girly' themes and I think there is both money to be made on these themes and enjoyment for my family, but I'm not looking at them in a holistic way. It really depends on the girl, if you ask me. My oldest (13) does not own any mini dolls. She is into Star Wars, Harry Potter, Minecraft and some Technic. My second (11) is a super Friend and only built her lone Creator set once. My 8-year old started on Friends, then Super Heroes, but her latest are Disney. My 6-year old just loves to build. I let her build my smaller Elves and JW, but she wanted Star Wars for Christmas and picked Rey's Speeder and Ariel's pet as a replacement for a duplicate from Nana & Papa. I suspect that the complicated nature of females is part of why the girl market is so tough to crack. 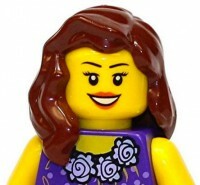 Great article, I also meet lots of girls who think LEGO is cool and genuinely like it. The creative side tends to entice them. Do your kids play soccer by any chance? Do your kids plays soccer by any chance? Nope. I have a cheerleader, 2 dancers, and a free spirit. Thanks for your insight. I have 2 young daughters myself (4 and 6), and it wasn't until they were born that I *really* became aware of how genderfied toys were. Wanting to share my love of Lego, I started them off on the Creator/Classic brick boxes as they were the most gender neutral as well as the least limiting in terms of their imaginations. Over the last year however, they've really gravitated to the Elves line which I've been happy to buy and build with them. While I'd be happy to get them into the Super Hero or any other sets I also enjoy, I feel self conscience that I'd be pushing them to be more "boyish" simply because I have no sons. Does that make sense? I think that what the kids are into is somewhat based on what we, as parents, push them into. When older daughter was born, I determined to try to get her into my stuff, but to support my kids in whatever they liked. I got her into Super Heroes early enough on that I figured it would stick. We had the Mickey Mouse characters and the Winnie the Pooh characters. But suddenly, Sofia the First came along and she was overthrowing her Super Heroes for princesses, which also graduated into fairies. I couldn't get her to watch Star Wars at all. My Second daughter seemed to be following the same mold. So, I bought them pretty princess stuff and Tinkerbell and her friends. Then Star Wars Rebels came along, and purely without my prompting, they both wanted to see that. I have since inundated them with Star Wars. Now they have a weird mix of Minidolls and Minifigures.They sometimes interact but are usually segregated. Sometimes the eldest tries to make one of the minidolls into Princess Leia. It will be interesting to me to see what they gravitate towards if I give them unfettered access to anything in the LEGO store. Although last time I argued with the 6 year old about how she's too old for Duplo for a long time. Hah! My daughters love their Frozen and Elves sets, but keep asking me to build them their own Dragon (4894 Mythical Creatures). I have a feeling the summer line of Elves with the Dragons will be a surefire hit in my house. I've got 2 daughters. The youngest is very passionate about lego, building elves, friends, mixels, creator and stuff herself. She has started to co-build my modulars. The eldest plays some lego, but has less focus and natural interest. As I believer each one should find his own talents, I leave her dance and sing :-). Good luck with your ventures in the future! Good luck with collecting and investing! I'm kind of new to it all myself. "I started to notice just how very male the Lego reseller market is." In what way? (other than that the majority of resellers probably is male I mean). Whoa- Legos are only for boys? Wow... my sisters, niece, and girlfriend are going to be seriously bumbed. We all must have missed the "for boys" sign on the boxes. Nice refreshing content here, thanks for adding it. I personally have one son, but my long-time girlfriend and her daughter have definitely caught the Lego "disease" from us. They both appreciate Star Wars, Harry Potter, Hobbit / LotR stuff much more than Friends or Elves. Naturally, the girlfriend likes many large exclusive Creator sets as well. So while I agree it is nice to see the company making serious effort to cater to female customers, I get the impression from my limited exposure to such opinions that the Friends and Elves lines are perhaps trying a little "too" hard. Not everything has to be pink or purple or saturated with estrogen to attract females. In fact I'd wager that most true "girly-girls" aren't going to be into Lego in the first place... so aiming for that sort of end-user is simply missing the mark a bit. Case in point - the "new" Disney line seemed to be a sure-fire runaway hit, but aside from some Elsa castle flipping a bit over a year ago, there hasn't proven to be the demand that many of us investors expected there to be thus far. Enough to justify production? Sure... and I'm glad the variety now exists. However, I suspect that a great many AFFOLs and YFFOLs would be happier with "normal" sets that have just a little extra female content. Ahsoka from Clone Wars may be a nearly ideal example of what attracts many of these end users. Again, I could be wrong, but that's the kind of thinking I am personally exposed to when it comes to females enjoying Lego. As for actual investing, I suspect that aptitude far exceeds interest for the average female, while the opposite is true of us males. Yep, I just said that. And since sarcasm and irony don't work online, I'm just kidding. Welcome and thanks for sharing. Almost makes me feel empowered enough to talk about my Rainbow Brite collection. Thanks for this post! I enjoyed the article and can relate to a lot of it. I do not recall ever having anything Lego at our house when I was a kid though. My brother had little cars and I had Barbie. I started to notice Lego after my daughter was born and she got some Duplo at some point. I loved the quality and detail. Eventually I bought some regular Lego "for when she is older", but I just really wanted to open it and play with it. She is now almost 8 and she is a Lego fanatic. It is the thing she spends the majority of her time doing. We homeschool so she has a lot of free time and I love to see the things she comes up with. For Christmas this year she had a wish list with such a variety of sets that people would ask me if it was right. She got most of the sets she asked for between us, grandparents, aunts, and uncles. They included General Grievous, Chima, Ninjago, Friends, Creator, Guardians of the Galaxy, Jurassic World, and Minecraft. Her favorite Lego is pretty much any and all animal figures, minifigures, and animals she builds with Lego. That's why she likes Chima so much. She thinks it's really silly when she hears someone say Lego is for boys (and we have heard people say that but thankfully, no one we know just people at the store). My sister and I both have huge collections and anytime someone finds out about it they seem really confused. They just do not get it. I am no master builder and do not have the imagination to come up with the stuff my daughter comes up with, but I do love to build from directions. It's very structured which seems to be good for my ADHD. :-) I personally love Harry Potter, Lord of the Rings, Elves, Friends, and Minecraft. Another AFFOL and SAHM here. Been lurking here for a few months, fascinated with reading as many posts as I can on this site. I have found the level of generosity with information here to be surprising. Im also a SAHM and AFFOL, and teach guitar part time. I didnt have many toys as a kid but treasured the ones I did have. I had never discovered lego until I noticed a Howarts castle in TRU while shopping for my son. It was the most adorable set and the minifigures looked like the movie characters. In spite of what seemed to be a ridiculously high price I had to pick it up for him. We built it together and I was amazed at every snap together of those perfect tight fitting little bricks. There was a sense of wonder for me on every new page turn of the build. And the minifigures...just wonderful. I became addicted and eventually we had every Harry Potter set. Then came every winter village set, finding out about online lego sites, AFOLs etc. I have three boys who love lego star wars, and a tiny baby girl who we try to keep from putting then in her mouth. I have yet to see what she will gravitate towards but I think it is a wonderful time to be a girl when we have options. I would have loved Friends as a little girl, but now I like the regular sets. Anyways, I have truly enjoyed reading here. Just that it's mostly men. Nothing else implied. Nicely written article, Poly; I personally enjoy these personal pieces about one's persona filled with personality personified. Also I believe there needs to be more of a woman's touch around here ....but that is just me. Any who, it is strange how when LEGO pushed their massive campaign of advertising for Friends upon initial release, the theme caused uproar as though the company had suddenly drew a line in the sand between girls and boys while the long running Belville theme prior seemed to have been forgotten entirely in the midst of it all which was way more pink and had little actual dolls. I can understand to a point how when LEGO (the product) was never really gendered to begin with now to start making specifically (and according to some, stereotypically) girly designs can cause waves. However the counterpoint could be looking at the length of time taken before LEGO finally released items the one part of the market (male or female) who does enjoy bright pastels, fashion, horses, and other bits of lifestyle no other theme (not even City) takes part in would enjoy putting together as any other builder. As for me I have a long street made up of all the little businesses from the Friends theme and what a colorful lineup it is. I am a man and I like Friends, damn it. I have two daughters (15 and 8). My oldest daughter has enjoyed Lego sets since she was little and likes to assemble the sets and then display them, she has never had any interest in the Friends line of Lego (she loves the Lego Architecture line which I think is great). My 8 year old likes to assemble sets and then plays heavily with them mixing and matching the different themes. She initially wanted some of the Friends sets (I thinks she was drawn in by the colors) but once those were built she did not really play with them at all, they just kind of sat around the edge of her Lego city while she played with the other sets and minifigures. When I asked her why she did not play with them she said they were kind of boring (I think the fact that you cannot mix and match the minifigure pieces has a lot to do with it). I never really thought of Lego as gender specific and I don't have an issue with Lego marketing specifically towards girls, I just wish they would be a little more creative in their approach rather than just creating a small doll that does not mix and match with the rest of their universe.